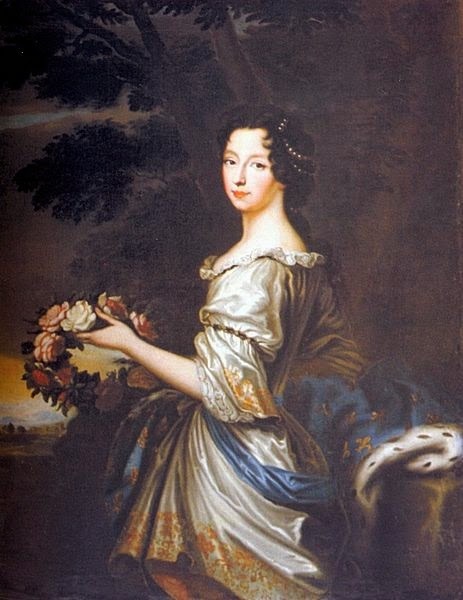 Little remembered today Anne Marie d’Orléans was the first Queen consort of Sardinia, the maternal grandmother of Louis XV of France, and an important figure in British history. Born on August 27, 1669, at the Chateau de Saint-Cloud, France, Anne Marie was the daughter of Duke Philippe I of Orleans, the younger brother of King Louis XIV, and his wife Princess Henrietta of England, youngest child of the unfortunate Charles I of England. Anne Marie barely knew her mother. Princess Henrietta died the following year, leaving all those who knew her, but her husband, devastated. Philippe didn’t waste any time to remarry. A year later, he tied the knot with Princess Palatine Elizabeth Charlotte. Elizabeth was a good stepmother to Anne Marie, whom she described as “one of the most amiable and virtuous of women.” The two soon became very close. When Marie was 14, the King, with the help of the comtesse de Verrué, the bridegroom’s mistress and mother of his two children, arranged her marriage to Duke Victor Amadeus II of Savoy, hoping the alliance would help maintain French influence in the north of Italy. In May 1684, the princess said goodbye to her family and left her native country to start a new life with her husband. Two years later, she gave birth to her first child, a daughter named Princess Maria Adelaide, (she would later become Dauphine of France and mother of Louis XV). The birth was so traumatic that, for a while, it was thought Anne Marie would die. She even received the last rights before, thankfully, she recovered. But the experience didn’t stop her from fulfilling her conjugal duties, and she gave her husband five more children. She would also devotedly nurse him back to health when he contracted smallpox. Anne Marie was very close to her pro-French mother-in-law, Marie Jeanne, much to her husband’s chagrin. Marie Jeanne had relinquished her position and power as regent only after Victor Amadeus’ marriage, and he now saw the friendship between his mother and wife as a political threat. Still, that didn’t prevent him from fighting against France in the War of the Spanish succession. It must have been a very difficult time for Anne Marie, who had relatives fighting on both sides. Eventually, the war was brought directly on her doorstep. Anne Marie, together with her younger sons, was forced to flee Turin while her husband stayed behind to defend the city besieged by her French and Spanish troops led by her half-brother, the Duke of Orléans, and her son-in-law, King Philip V of Spain. It seemed an impossible task, but Victor Amadeus managed to hold out long enough for the Prussians and Russians troops to come to his rescue. For his effort, he was rewarded with a crown. When the war ended in 1713, Victor Amadeus became king of the Kingdom of Sicily, formerly a Spanish possession, but was forced to trade it in 1720 for the less prestigious Kingdom of Sardinia. By then his eldest son had died. His loss had plunged his parents into a severe depression. In 1714, when Queen Anne of England died, Anne Marie, thanks to the Stuart blood of her mother, became the heiress presumptive to the Jacobite claim to the thrones of England, Scotland, and Ireland. The crown had passed to the Protestant George I, but Prince James Francis Edward Stuart, son of the deposed King James II, still had hopes to regain his father’s throne. Anne Marie was his heir but was displaced in 1720 with the birth of James’ son Prince Charles Edward Stuart, better known to history as Bonnie Prince Charlie. Queen Anne Marie died of heart failure at her villa on 26 August 1728, one day before turning 59. She was buried at the Basilica of Superga in Turin, where all her children but two also rest. Why Did Pauline Bonaparte Cover Her Ears?